Fossa ovalis atrial septal defect (ASD) is a common congenital heart defect with left to right shunt, which needs closure by transcatheter method or surgery. Device closure of ASD is a well-established procedure; however, various methods of deployment are described in challenging cases. ,, Right aortic arch (RAA) is usually associated with certain congenital heart defects like Tetralogy of Fallot, pulmonary atresia with ventricular septal defect, truncus arteriosus and, rarely, with isolated ventricular septal defect. Fossa Ovalis ASD associated with RAA is rare. We describe technical difficulties encountered during transcatheter closure of ASD associated with RAA. A 30-year-old male presented with dyspnea on exertion NYHA class II. The general examination showed pulse rate of 76 bpm and BP of 126/74 mmHg in the right upper arm. Cardiovascular system examination revealed normal first heart sound, wide fixed second heart sound, 3/6 ejection systolic murmur and a short mid-diastolic flow rumble on the left sternal border. A chest roentgenogram showed cardiothoracic ratio of 0.6 with increased pulmonary vascularity. Electrocardiogram showed normal sinus rhythm, right axis deviation and incomplete right bundle branch block. Transthoracic echocardiogram showed normal situs, normal atrioventricular- ventriculoarterial concordance, normal systemic and pulmonary venous drainage and a large fossa ovalis ASD with left to right shunt. 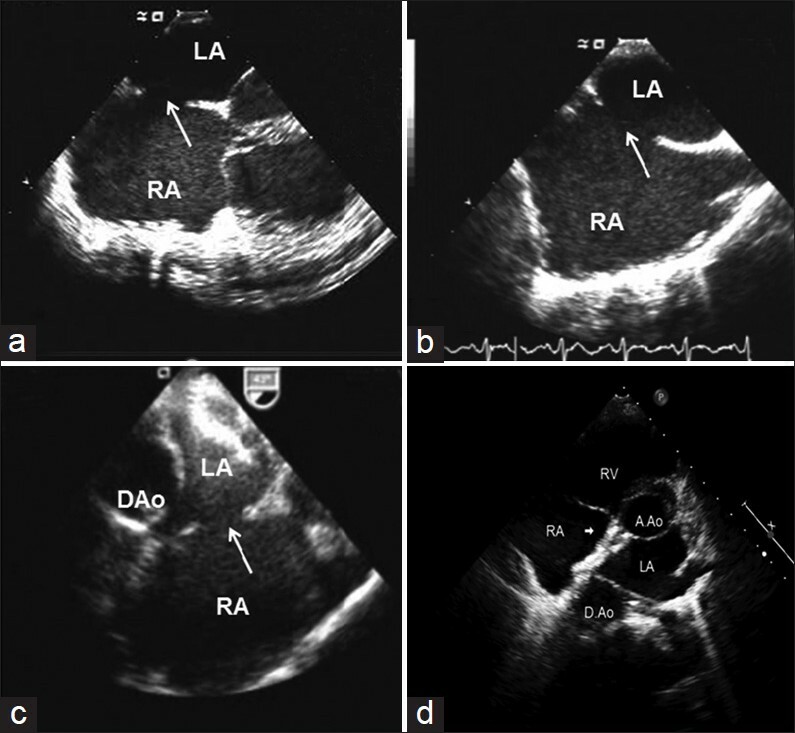 Multiplane transesophageal echocardiogram (TEE) measured a 25 mm × 22 mm ASD with adequate rims all around the defect [Figure 1]a and b. The patient was taken up for transcatheter device closure of ASD after informed consent. Intravenous heparin and prophylactic antibiotics were given as per the protocol. A right femoral venous access was obtained under standard aseptic conditions. The left upper pulmonary vein was entered using a 6F multipurpose catheter. A 0.035" Amplatzer extra-stiff wire was positioned and exchanged for a 12F delivery sheath (Life Tech Corp., Schenzen, China). A 26 mm Heartr septal occluder (Life Tech Corp.) was selected and loaded on to the delivery system for the deployment from left upper pulmonary vein. The left atrial (LA) disc was released gradually; however, it could not be positioned well in LA. There was partial prolapse of the device through the antero-superior aspect of the ASD [Figure 2]a. Several attempts were made to deploy the device from LA appendage and roof of LA, but were unsuccessful. Critical analysis of the TEE images then revealed a vascular structure causing an indentation into the posterior-superior aspect of LA [Figure 1]c. Impingement by this vascular structure caused unusual orientation of LA disc, resulting in improper accommodation of the device in LA. At this point, we suspected a RAA, and an aortogram was performed after obtaining right femoral artery access using a 6F pigtail catheter. The aortogram in antero-posterior and left anterior oblique views confirmed RAA with aberrant left subclavian artery arising from a diverticulum of Kommerell [Figure 2]b. The right descending aorta causing indentation and impingement on the device was confirmed when the device was positioned in LA. At this point, it was decided to deploy the device from the right upper pulmonary vein (RUPV), keeping the LA disc of the device away from indentation of the pulsatile right descending aorta. Hence, the procedure was modified by positioning the sheath in the RUPV. 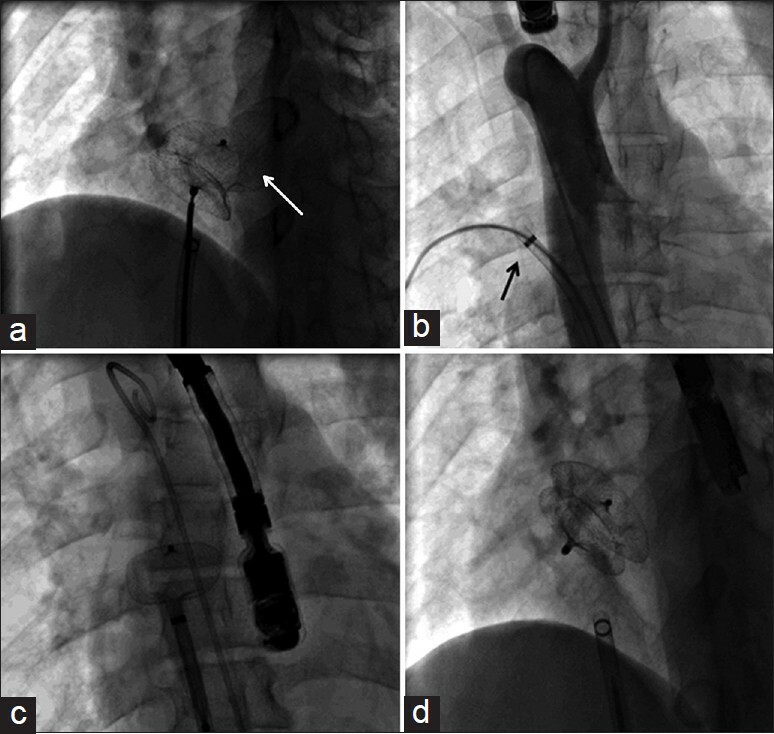 Now, the LA disc was successfully deployed after anchoring in the RUPV [Figure 2]c. The continuous TEE confirmed position of LA disc away from the right descending aorta and, subsequently, the RA disc was released. Assessment by TEE and fluoroscopy showed transient abnormal rocking movement of the device due to transmitted pulsations from the right descending aorta. The 26 mm Heartr septal occluder was successfully deployed from the RUPV after confirming stability by push-pull wiggling. There was no residual leak or pulmonary venous obstruction by TEE. 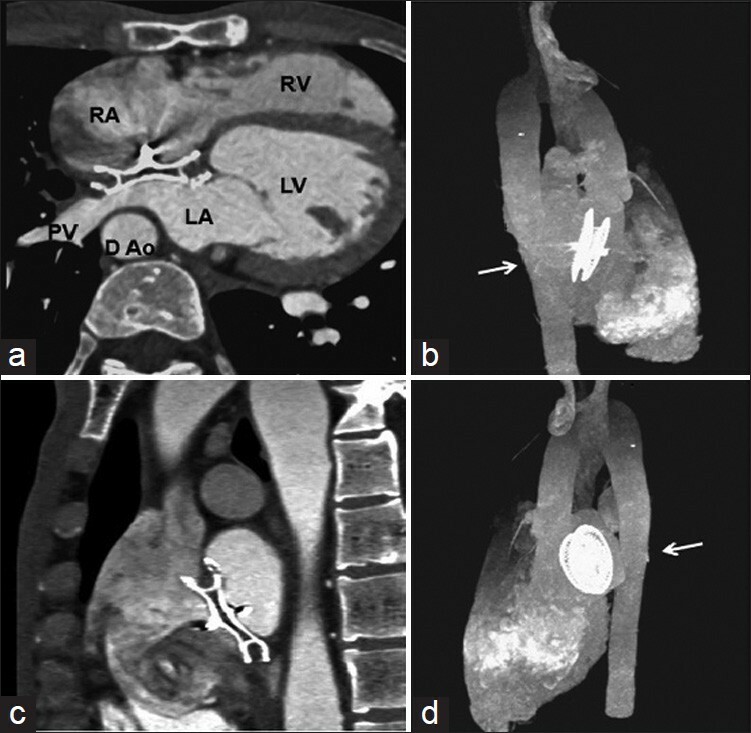 The follow-up assessment by CT scan at 3 months and TEE after 18 months showed a well-positioned device with no pulmonary venous obstruction [Figure 3]. Transcatheter closure of ASD is a well-established procedure using various types of devices. Deployment from the left upper pulmonary vein (LUPV), left atrial appendage, balloon-assisted technique, using Hausdorf sheath and RUPV methods are described for large defects with deficient rims. ,, Difficulty of deployment of the atrial septal occluder in ASD associated with RAA is not described so far. However, Hill et al. reported successful transcatheter closure of residual ASD using an 18-mm Amplatzer septal occluder in a child who underwent neonatal repair of Tetralogy of Fallot with RAA. In our case, the diagnosis of RAA was not made in the initial diagnostic echocardiogram, and was recognized only after encountering the difficulty of deployment of LA disc. This is due to the right descending aorta causing indentation in the LA close to the interatrial septum leading to improper accommodation of LA disc. The descending aorta usually crosses from left to right at the upper or mid-thoracic level and, in our case, it chose to cross at the level of the LA thus causing the problem. It does give a new description of posterior "torus aorticus" of the atrial septum. The device was deployed from the RUPV, which was away from the right descending aorta. This modification aligned the LA disc close to the interatrial septum without impinging on to the vascular structure. The follow-up assessment of the case reported by Hill et al. showed RUPV obstruction needing surgical removal of the device. The RUPV obstruction in this case was probably due to a large device in a small child in the presence of RAA leading to encroachment into the pulmonary vein, whereas the present case is an adult and the device was away from the RUPV; however, close monitoring is needed. Our patient was followed with computed tomography scan at 3 months and TEE at the end of 18 months after device deployment revealed stable device position with no pulmonary venous obstruction. The reported incidence of right-sided aortic arch ranges from 0.04% to 0.14%. , Felson and Palayew in 1963 described the two types of RAA commonly observed, the anterior or RAA with mirror-image branching of the major arteries (Type I) and the posterior or RAA with an aberrant left subclavian artery (Type II). A third type of RAA associated with isolation of the left subclavian artery is rarely encountered. In Type II RAA, as seen in our case, four vessels arise from the right arch in the following order: a left common carotid artery, a right common carotid artery, a right subclavian artery and an aberrant left subclavian artery, arising from the descending thoracic aorta. Congenital heart defects are usually not associated with this type of RAA. Type II RAA patients in general remain asymptomatic or may present with symptoms related to vascular rings. Our case is unique in its rare association of ASD with Type II RAA, and the symptoms are essentially related to left to right shunt. The symptoms related to vascular ring is not seen in our case and hence advised medical follow-up. ASD associated with RAA is rare and may cause a difficulty during the device closure of FOASD. The right upper pulmonary vein method is useful in such a situation. Follow-up assessment is needed to see the pulmonary venous obstruction. 1. Allen HD, Driscoll DJ, Shaddy RE, Feltes TF. Moss and Adams' Heart Disease in Infants, Children, and Adolescents: Including the Fetus and Young Adults. 7 th ed. Baltimore, MD: Williams and Wilkins; 2008. 2. Dalvi BV, Pinto RJ, Gupta A. New technique for device closure of large atrial septal defects. Catheter Cardiovasc Interv 2005;64:102-7. 3. Holzer RJ, Cheatham JP. Transcatheter Closure of ASDs -An overview of therapeutic options for atrial septal defect closure. Card Interv Today 2008;2:18-24. 4. Fu YC, Cao QL, Hijazi ZM. Device closure of large atrial septal defects: Technical considerations. J Cardiovasc Med (Hagerstown) 2007;8:30-3. 5. Knight L, Edwards JE. Right aortic arch. Types and associated cardiac anomalies. Circulation 1974;50;1047-51. 6. Hill K, Christian K, Kavanaugh-McHugh A, Doyle T. Right-sided pulmonary venous obstruction between a right aortic arch and an amplatzer septal occlusion device following closure of a secundum atrial septal defect. Pediatr Cardiol 2009;30:855-7. 7. Moes F, Freedom R. Rare types of aortic arch anomalies. Pediatr Cardiol. 1993;14:93-101. 8. Mahoney EB, Mannning JA. Congenital abnormalities of the aortic arch. Surgery 1964;55:1-14. 9. Felson B. Palayew Mi. The two types of right aortic arch. Radiology 1963:81:745-59.